Creating With Carol: HAPPY CANADA DAY!!! 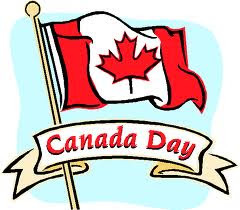 Happy Canada Day to Everyone in this Wonderful country! I hope you are celebrating and having a good time. If you are new to Canada - WELCOME! If you have been here 'forever', take a moment to appreciate everything that Canada offers. My family came to Canada from England in 1783. My ancestor's name was John Higgins and he was a farmer from Wiltshire. He and his descendents farmed some little part of Nova Scotia ever since. I live in Nova Scotia which is the long skinny blue province on the right of the map below. I have been fortunate to live in three provinces during my life - Nova Scotia, New Brunswick, and Newfoundland. Plus I have travelled across the country, but haven't made it up north as yet. Did you know that London, England is closer to Halifax, Nova Scotia, than Vancouver, British Columbia (the island off the pink province on the left) is to Halifax, Nova Scotia?! Yes, we're big and beautiful! Thanks for stopping by! Now Celebrate! !